The Down Alternative For Sheraton Hotel Lovers! Your down alternative choice when you love Sheraton® Hotels. 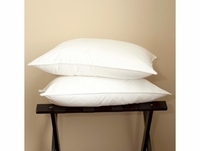 The Down Lite® Enviroloft™ pillow give you’re the luxury of a pillow featured in many Sheraton ® Properties without breaking the bank sleeping there. This pillow is 100% Hypo-allergenic and has a wonderful 250 thread count cover that you will love to fall into every night.